In the past week, I have had the pleasure of attending two concerts at Symphony Hall in Boston. The first featured legendary vocalist Barbara Cook and the other the Jazz at Lincoln Center Orchestra led by the incomparable Wynton Marsalis. Both were part of the Celebrity Series, and as always both were phenomenal. 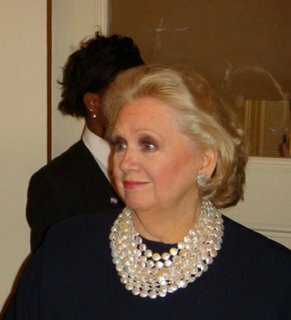 Approaching eighty years old, Barbara Cook is best known for her work on Broadway, especially for originating the roles of Cunegonde in Leonard Bernstein's Candide and her Tony Award-winning Marian the Librarian in Meredith Wilsons' The Music Man. Since leaving Broadway she has made a career of the concert stage with such critically acclaimed shows like Mostly Sondheim and Barbara Cook's Broadway. Keeping with her recent Sondheim theme, the Celebrity Series performance was entitled "No One Is Alone" from the musical Into the Woods. Singing songs written by one of Broadway's greatest composers and songs he wished he had written, Ms. Cook ran the gambit of Oscar Hammerstein, Richard Hart, Milton Ager, Irving Berlin, Harold Arlen, and Johnny Mercer. Hearing her sing songs like "A Wonderful Guy" from South Pacific and Cliff Edwards' "My Dog Loves Your Dog" it becomes obvious that Ms. Cook loves what she is doing. She takes such joy from performing, and the audience cannot help but join her, tapping their toes with smiles on their faces. It is her emotion that sets her apart as a vocalist. Singing "Farewell Letter" from Sondheim's Passion (his second masterpiece after Sweeney Todd according to Ms. Cook), she b rought a tear to her own eye, as well as many in the audience. The Jazz at Lincoln Center Orchestra concert was a light-hearted romp through everyone's favorite jazz standards. 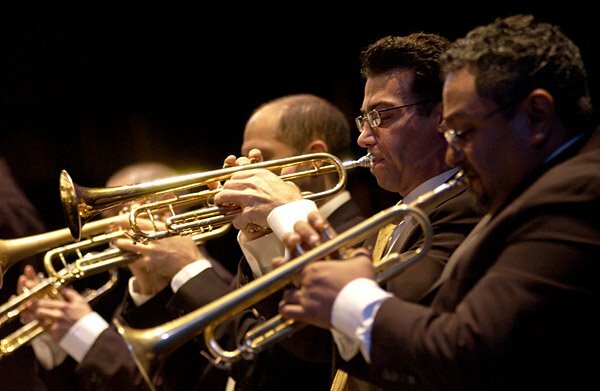 Under the direction of trumpeter Wynton Marsalis, JLCO has become one of the nation's preeminent jazz organizations dedicated to education and performance. Spending almost half of the year on tour, the fifteen musicians who make up JLCO are each incredibly talented performers in their own right, but together they swing like nobody's business. 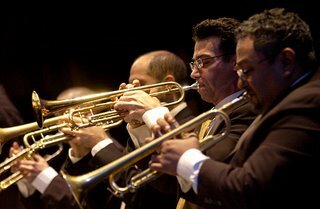 Playing arrangements by Duke Ellington, Dizzy Gillespie, and Louis Armstrong, JLCO performed such favorites as "On the Sunny Side of the Street," "A Night in Tunisia," "Tea fo r Two," "Rhapsody in Blue," and "Autumn Leaves." No one has more fun performing than jazz musicians, and this concert was no different. In addition to the musical fireworks on stage, the audience was almost as much fun to watch. An eclectic cross-section of ethnicity and ages, it just proved once again that jazz is truly American music, democratic in every way. The highlight of the show was Dan Nimmer, the ridiculously young pianist (he's only twenty-five) who plays with the intensity of a classical viruoso and the soul of of the Duke himself. 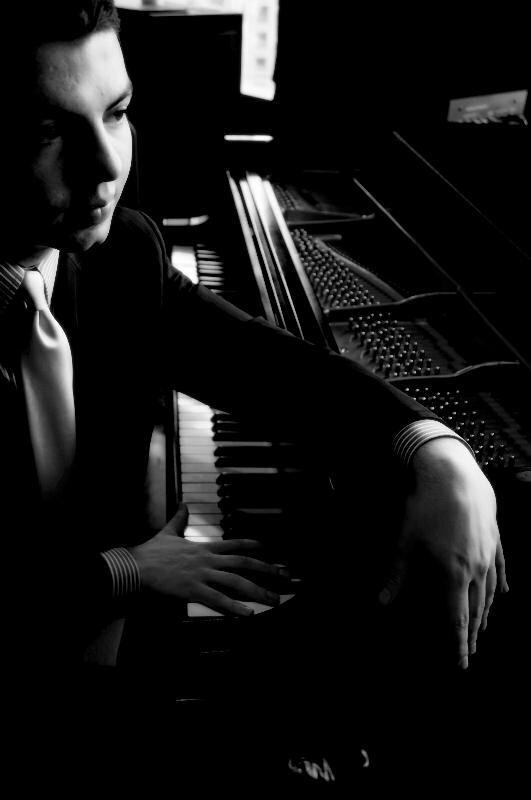 First having heard him with Wynton a year ago, there is no doubt that he is bound for a tremendous career. Though I prefer when Wynton performs with his own bands, maybe because it is Wynton wailing every song, JLCO is a must see experience for any jazz lover.